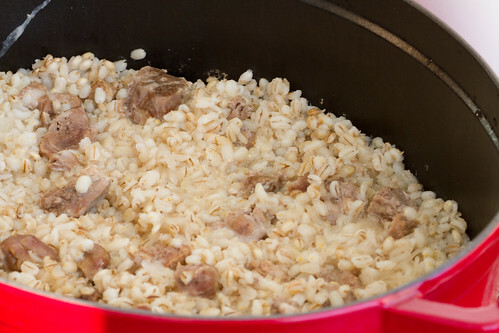 Mulgi kapsad aka mulgikapsad is a traditional dish from Southern Estonia, consisting of pork, sauerkraut and barley (either pearl barley or barley groats). It doesn't sound much - but it's another one of those dishes that tastes much more and better that you'd imagine when looking at the (short and rather bland) list of ingredients. 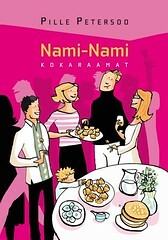 It's also cheap, filling and substantial, a perfect winter dish, which deserves attention outside Estonia as well. Hence this blog post. * PS This dish is wheat-free. If you want a gluten-free version, then feel free to use porridge/pudding/risotto rice instead of barley. Now sprinkle with salt (about half a teaspoon should be enough in most cases) and pour over enough water to barely cover the ingredients. Cover with the lid, bring into a boil. 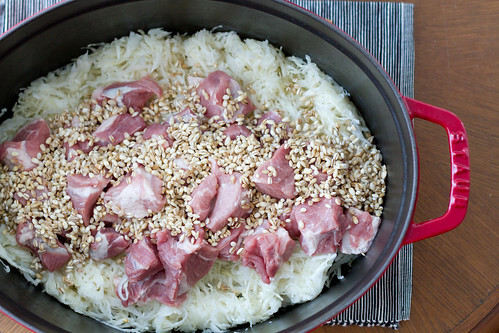 Reduce heat and simmer gently for about 2-3 hours, until the food is done. NO NEED TO STIR IT, though you may want to peek under the lid couple of times and add a little water, if it seems too dry. (You can also cook it in the moderate oven, if you prefer). Taste for seasoning - if you need, add a bit more salt. 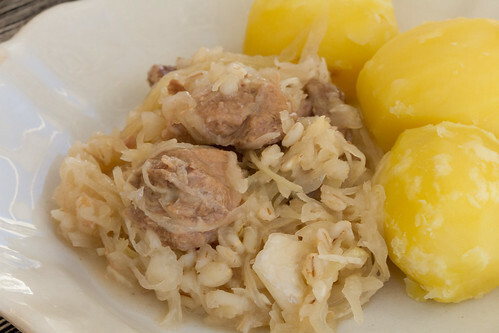 Some people add a bit of sugar as well, but I don't - it all depends on the flavour of your sauerkraut. 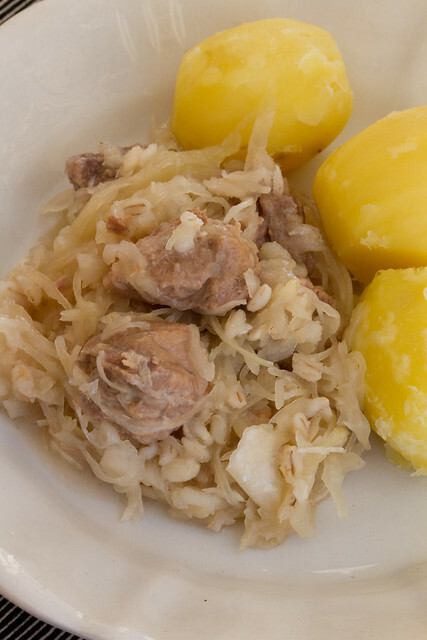 Mulgi kapsad is not supposed to be sweet-and-sour, but you may need some sugar to balance the acidity, if your cabbage is very sour. Serve with boiled potatoes, with a good dollop of nice thick sour cream on the side, if you wish. I grew up eating this until I became a vegetarian. Now I make hapukapsas and add the barley, but no pork. Still delicious! 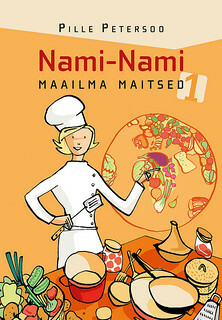 We make a vegan version at Polli Talu and it is delicious as well. We just omit the pork and like to add some shredded carrots for color. 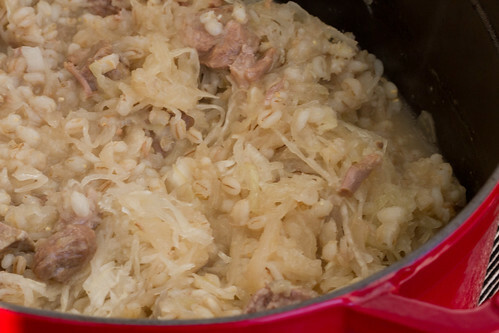 I wouldn't have put sauerkraut and barley together, but since I have both, and a reasonably pork substitute, I'll have to try this!